It had to happen sooner or later. 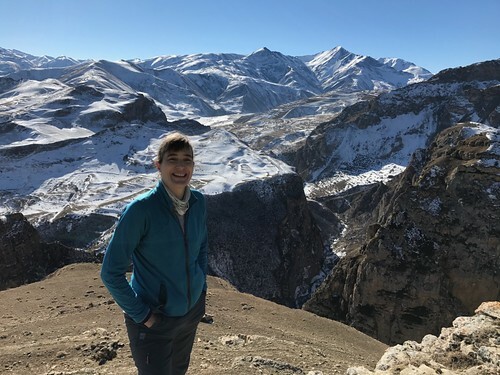 Eventually, if I kept at it, there had to be a day when a Bag Baku expedition would end up falling in the tiny, magical intersection on the Tourism Venn Diagram where Spectacular Scenery, Perfect Weather, Interesting Activities, Delicious Food and Good Scheduling all meet. 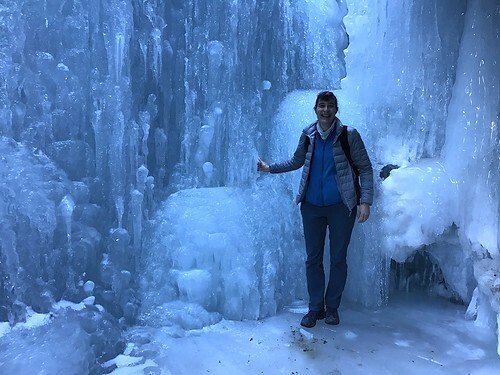 On my first weekend back from the Christmas break I finally hit that sweet spot on a trip to the frozen waterfall at Giriz. 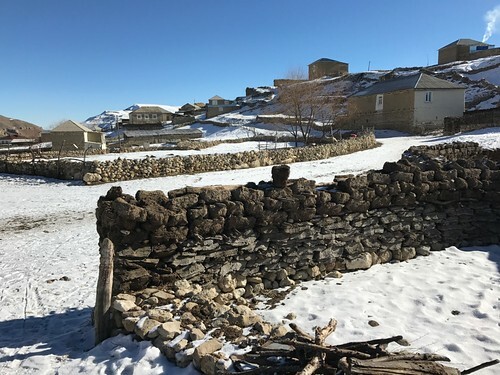 Giriz is a vanishingly tiny village in the north of Baku, not far from the Russian border and well into the southern tip of the Greater Caucasus Mountains. It’s home to just 32 families. The heart of downtown Giriz. Also the suburbs. And the Business District. And… well you get the idea. The wall in the foreground is constructed partly from rough stone and partly from bricks made with animal dung and straw. But I’m getting ahead of myself a bit. Back to the beginning, which was at Nizami metro station at 7:30am on my first Sunday back. Unsurprisingly we got a late start because our driver overslept. This turned out to be fine though, because there was a brightly lit café nearby where our small group could sit and have tea and little pastries and warm up while we were waiting. It was a civilised way to start. 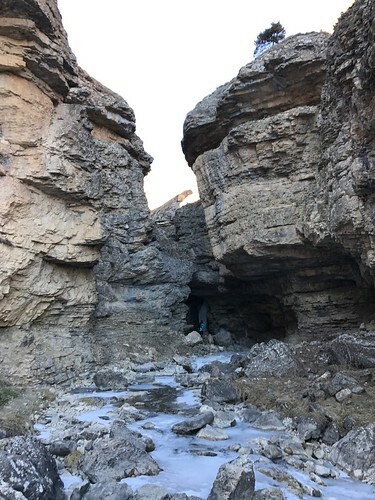 Once we were underway it was a two hour drive in the minivan to Quba, the small capital city of the northern Quba region of Azerbaijan. And that’s when the real adventure started. Astute Go Stay Work Play Live Readers will recall my friend and fellow adventurer Raul from the rainy trudge up to Chirag Gala (an outing that, while worthwhile, definitely was not an ideal Venn diagram of tourism bliss). Raul came along for this trip too, and had warned that the road between Quba and Giriz was, er, challenging. 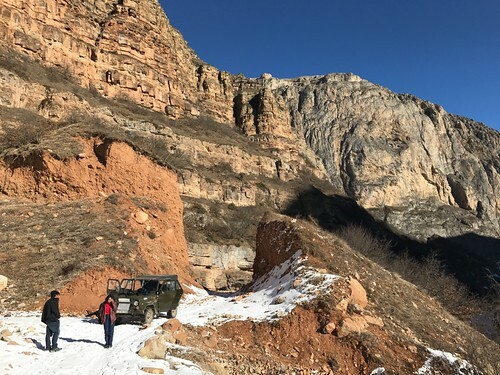 And he’d warned that in Quba we’d have to leave our comfy minivan and transfer to a much sturdier 4x4 for the trip up the winding mountain track. Here’s our ride. A 1986 UAZ. The UAZ is a legendary Soviet-designed off-road military vehicle now available to the public. UAZ (pronounced like a word: YOU-az) are renowned for their ruggedness, go-anywhere abilities and ease of repair. And apparently some are still made in Azerbaijan! Eight of us crammed into the car - two facing towards each other in the far back, four squeezed into the back seat, and one in the front with the driver. I’ll admit I was nervous about the drive. I’ve heard tales of these mountain drives from others and I had uncomfortable visions of tipping slowly over the side of an unguarded edge or ending up under a sudden rock slide. Obviously that didn’t happen, but I don’t mind saying I now truly understand, deep in my bones, the origin on the phrase “white-knuckle ride”. Luckily it gradually emerged that our driver, who was celebrating his 63rd birthday that very day, grew up in Giriz, moved to Quba thirty years ago, and has been driving this same road, possibly even in the same UAZ, ever since. It was very reassuring. It was also simultaneously reassuring and alarming that he stopped to put on tire chains after we lurched off the main road and onto the track for the last stretch up to Giriz. Stopping for the tire chains. As you might be able to tell from the photos so far, the weather was stunning. Perfectly clear blue sky with temperatures hovering just above freezing, but feeling much warmer in the strong sunshine. The only thing missing was the sunglasses forgotten on my desk back at the hotel, which is why most photos of me on the trip are decidedly squinty-looking. As we finally rolled into Giriz, we saw an old gentleman waking up the road who turned out to be our driver’s 83 year old father, who still lives in the village with his mother. We also saw and waved to his mom in the distance who was busy with some outdoor chore near the family home. 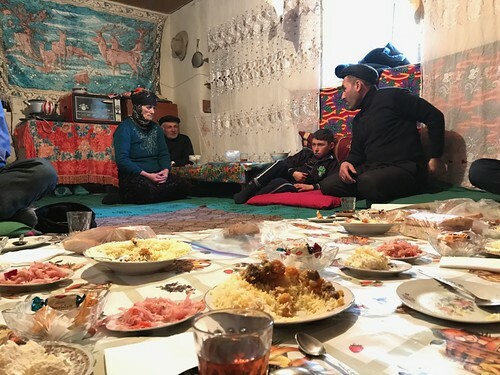 We, on the other hand, proceeded to a different family home where our guide Sabina had arranged for us to have lunch before we started the hike to the waterfall. Here’s a not-great shot of the house - the two-story job on the left. 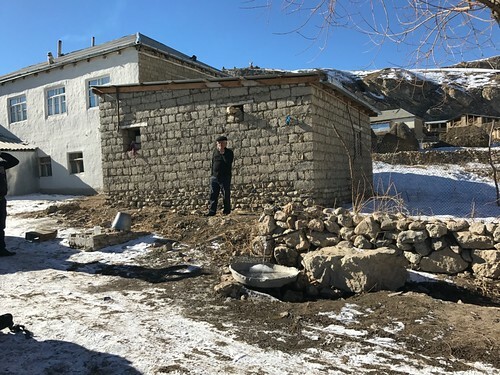 With no plumbing inside, the family’s water source is the constantly trickling, icy flow of mountain run-off from the pipe in the foreground, dropping into a battered, flat metal basin, then overflowing and draining away. There was a bar of soap on the big rock. There’s so much in this photo. The mom, wearing a traditional head covering that she’s probably worn every day of her adult life. 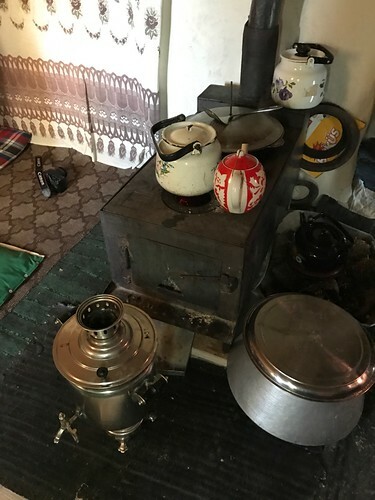 Behind her is a high table with a two burner hotplate and an old electric counter-top oven, though all the cooking that day was done on the woodstove. Two of the men of the house, also very traditionally dressed. And the little boy, who never budged from his warm cushions, but often played with the remote control for the tv that was on constantly in the back corner. And the food! Homemade salty sheep milk cheese, plates of pink salt-pickled cabbage, and bread for days. Of course we also had a plov made with rice, lamb and dried fruit. And tea. Endless tea, with ample cubes of sugar. And here’s the heart of the room - the stove and samovar. Strong black tea is stewing in the red pot on the stove and the samovar holds hot water to thin out the potent brew. Fuel for the stove was dried animal dung. And the flat dish behind the teapots held the most delicious potatoes I’ve eaten in some time. I think they were approximately equal parts potato and homemade butter, with perhaps a touch of turmeric for colour, slow cooked into a soft and utterly irresistible dream. We had the potatoes when we returned to the house after the waterfall hike, so I’m getting ahead of myself a bit, but whatever. Also, weirdly, when I was commenting about the deliciousness of the potatoes that afternoon it came out as “Belicious topatoes”. I plead tiredness and extreme butter poisoning, but now whenever I think of that dish now I think “Damn, those really were some belicious topatoes.” When we came back for the topatoes, there were also tiny dishes of powdery, dirty coloured salt. This was another homemade treat where salt is ground with a blend of herbs and spices into a special mixture that complemented the topatoes perfectly. Fortified with tea and plov, we set out for the walk to the waterfall, and it was lovely. A bit steep but not at all unmanageable. And the pace was pleasant, and the group was small, and the scenery was, to put it mildly, not bad. Me squinting in the sun with the mighty Caucasus behind me. And here’s a fun shot of the group at our designated stopping point, where the rule seemed to be that you were supposed to stand on the very edge and have your picture taken posing like Leonardo di Caprio in “Titanic”. So we did. The hike was less than an hour long, though it didn’t feel hurried and it did feel like a proper effort. 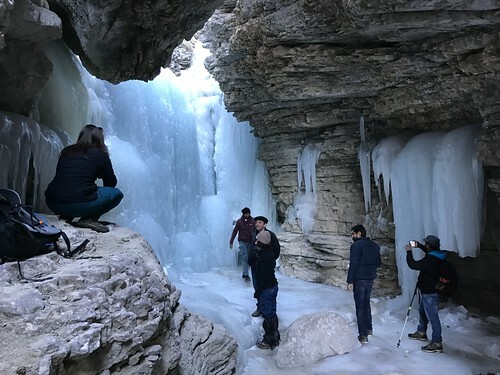 And I’m embarrassed to report I don’t even know the name of the watercourse that tumbles through the rocks and freezes into a fantastic, ever-changing sculpture every year. And I’d say it was worth the trip. It’s not big, but it is impressive, and we had it all to ourselves. 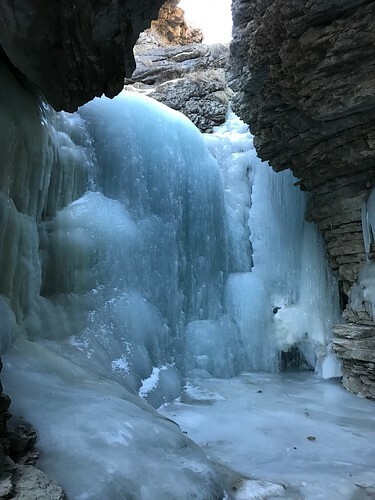 You could hear the water running behind the ice, and see it dripping slowly down the face of the sculpture. We hung around taking photos, slipping on the ice, goofing around, and having a warming shot of tea-and-vodka thoughtfully provided by Julie, who’d done the hike three times before and clearly had things sorted out. (A fellow Canadian, naturally) And then it was time for the hike back to the village for tea and belicious topatoes. I think we’d all have preferred to curl up for a quick nap after the food, but we soon had to pile back into the trusty UAZ for the trip back down because it was VERY IMPORTANT that we not end up on the difficult part of the road after sunset. However, this didn’t prevent us from stopping the car on the way out of the village to greet the driver’s dad in person, who was once again spotted trudging through a field alongside the road. He was on the other side of a low stone wall, and came over when we stopped. A few of us went to help him over the wall but he brushed us off and nimbly stepped over like a man half his age. I think you’ll agree this guy is totally excellent. And has the best moustache EVER. Finally there was nothing to do but confront the road. It was another white-knuckle job, perhaps worse because this time we were at least partially giving ourselves over to gravity. (I took a video of a short section of hairpin turn. It’s here.) Unbelievably, Sabina actually FELL ASLEEP for part of the descent, which I suppose I should find reassuring. And then were were back in Quba and saying good bye to our lovely driver, whose name I never learned but who got a deeply heartfelt thank you and happy birthday from me before we parted. The drive from Quba to Baku was dark and quiet and sleepy. Raul and I chatted and contemplated what a completely different place Azerbaijan is when you get out of Baku. I’m glad I’m taking the opportunity to see some more of the country this time. 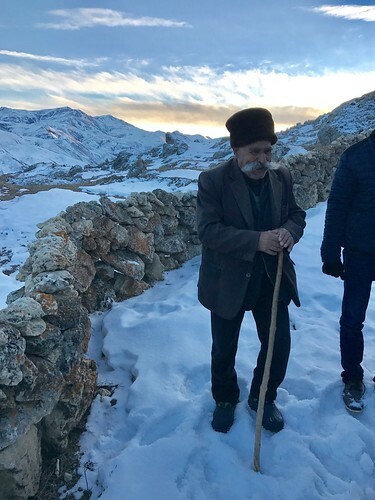 As Raul often reminds me, about ten percent of the population of Azerbaijan are still subsistence farmers like the family we visited. They live off what they grow, the animals they raise, and a heartbreakingly tiny state pension. 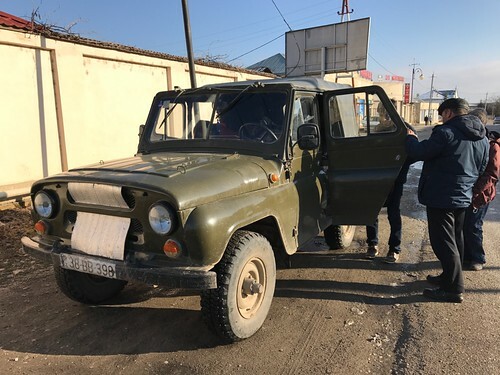 I’m also glad that some of the 50 manat we each paid for the day’s tour went to that driver and his trusty UAZ, and that family and their belicious topatoes. 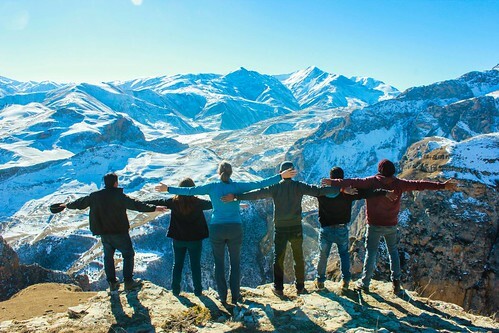 “Behold the Grandeur of the Mighty Caucasus Mountai… Oooooh! Crisps!" P.S. There are a lot more photos in a Flickr album, which I'd recommend having a look at, because they include a shot of... you guessed it... some truly belicious topatoes. You are a brave and adventurous soul! I don't think I would have survived that drive.